Without phoneme awareness, students may be mystified by the print system and how it represents the spoken word. No matter the level of phonemic awareness, to make use of it he or she [the student] must learn to visually identify the individual letters. Explicit instruction in sound identification, matching, segmentation, and blending, when linked appropriately to sound-symbol association, reduces the risk of reading failure and accelerates early reading and spelling acquisition for all children. 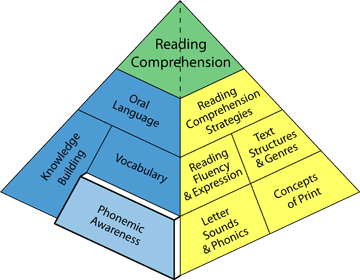 Read more about phonemic awareness! Phonemic awareness is an oral language ability that students demonstrate when they can play with the sounds in words. For example, they can change a sound in word to make a new word, blend sounds together to make a word, or break words into individual sounds. Phonemic awareness helps students read by sounding out and blending letter sounds together, and to spell by breaking apart the sounds in a word. Teachers can use a number of brief and engaging activities such as songs and games to facilitate students’ phonemic awareness. Teachers can model key skills and provide opportunities for review. They can start with simple phonological awareness activities, including rhyming words, and move toward those that involve the identification and/or manipulation of the sounds in words. Teachers can assess phonemic awareness in many ways. They can observe how their students respond to various phonemic awareness tasks and complete informal assessments of important phonemic awareness skills such as blending and segmenting. Gathering this information can aid in lesson planning and the identification of students at risk for reading difficulties.